Retreats are resolved only after any hits have been resolved by removing blocks from the affected unit. For each flag rolled against the target unit, the unit must move one movement back toward its own side of the battlefield. A movement is the maximum number of hexes a unit may move when given an order. 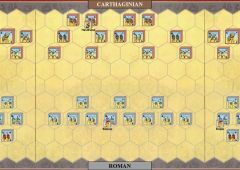 Example: a light horse unit incurring one flag against it would retreat its maximum move of 4 hexes. 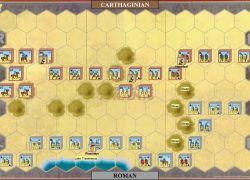 If two flags were rolled against it, the light horse unit would have to retreat 8 hexes! 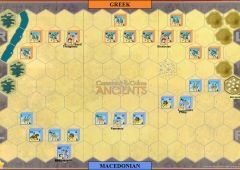 A light infantry unit would retreat 2 hexes for each flag rolled against it. If three flags were rolled against the light infantry unit, it would have to retreat six hexes. A unit must always retreat toward its controlling player’s side of the board, regardless of what direction the attack came from. Units may never retreat sideways. A unit without an attached leader may retreat onto a hex that contains an unattached friendly leader (i.e. a leader alone in a hex). 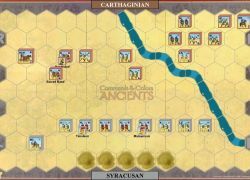 The leader is immediately attached to that unit and the unit’s retreat stops in the leader’s hex. The unit ignores any additional retreat movement. If a unit cannot retreat because its retreat path is occupied by units (regardless if friend or foe), an enemy leader that is alone in a hex, or it is forced to retreat off the battlefield or onto a hex that has impassable terrain, one block must be removed from the unit for each hex of the mandated retreat movement that the unit cannot fulfill. 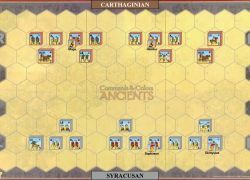 If a unit can retreat legally (first bullet) without taking block losses, it must take this retreat path Instead of one where block losses occur. 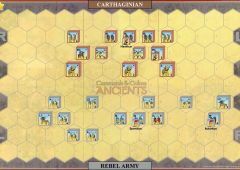 Example: if a light infantry unit must retreat when it is on its own baseline, its retreat should be 2 hexes. 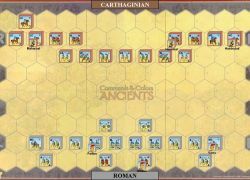 However, because it is at the edge of the battlefield it cannot make any retreat movement and therefore must lose 2 blocks—one block for each retreat hex it cannot fulfill. 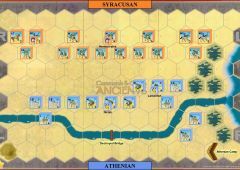 A: The medium infantry unit attempts to battle the light bow infantry unit (both units are reduced), but the defending unit Evades instead. 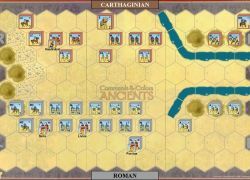 The Roman player rolls 4 dice but only green circle symbols will hit. If the evading unit survives, it must be moved 2 hexes towards its battlefield edge. In this case it can only Evade one hex (which is allowed if there is no alternative). 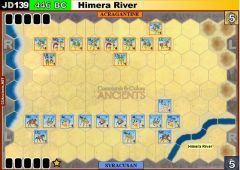 D&E: The heavy infantry unit with an attached leader conducts Close Combat against hex D. Even though the heavy infantry unit has only one block left it still battles with 5 dice. The result is 1 hit and 1 helmet-enough to eliminate the unit. 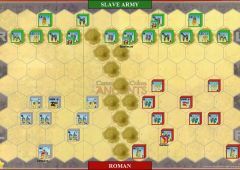 The heavy infantry unit and leader advance, and then make a bonus Close Combat against hex E. The cavalry unit evades. 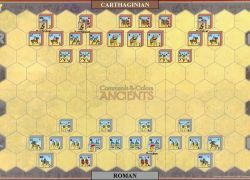 Before the Evade movement is carried out, the Roman player gets to roll 5 dice, but will only hit on blue triangle symbols. 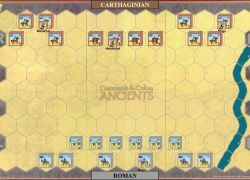 B&C: The heavy cavalry unit (4 battle dice) Close Combats the chariot unit and forces it to retreat (chariots may not Evade against cavalry). The heavy cavalry unit can now make a Momentum Advance through the vacated hex and onto hex X. From there it conducts a bonus Close Combat against the slingers in hex C who have no chance to Evade. 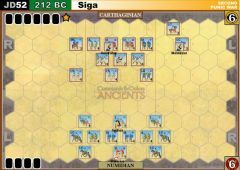 The result of 4 dice is 1 hit and 1 flag, and since the slingers’ retreat path is blocked, this is enough to eliminate the unit. 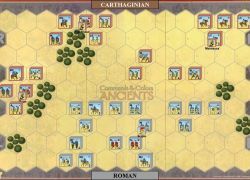 The heavy cavalry unit could make another Momentum Advance onto the hex, but would not get the one additional hex or another bonus Close Combat this turn. a ranged fire attack. The owning player sees that he faces close combat that may be dangerous, so he chooses to ignore one flag and accept the other. He must retreat the unit 3 hexes or suffer normal consequences for being unable to do so. Some situations allow a unit to disregard one or more flags rolled against it. If more than one of the following situations applies, the effects are cumulative. A unit in such a situation may ignore flags each time it is attacked. Note that disregarding a flag result is purely a matter of choice. The owning player may decide he wishes to accept a flag result (which could take his unit out of danger). If more than one flag result can be ignored, the owning player can choose to ignore one (or more) and accept one (or more), but, if he accepts a flag result, he must retreat the full amount that each flag would normally cause. EXAMPLE, a medium cavalry unit with an attached leader and bolstered morale receives 2 flag results from a ranged fire attack. The owning player sees that he faces close combat that may be dangerous, so he chooses to ignore one flag and accept the other. He must retreat the unit 3 hexes or suffer normal consequences for being unable to do so. An elephant, when it retreats, goes on a Rampage before it is moved back. All units and any leaders who are alone in adjacent hexes (friend and foe) must check to see if they are trampled. (This can include the attacker who prompted the Rampage!) 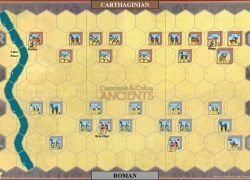 Roll two dice for each adjacent hex with a unit or a lone leader. During a rampage, your opponent rolls for hits on your units, and you roll for hits on his units. A hit is scored when the symbol rolled matches the unit type. A leader helmet will eliminate a lone leader. If the leader is not hit on the rampage roll he must evade. All other symbols are ignored. An elephant unit is attacked and two flags are rolled against it. 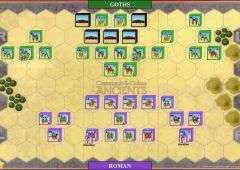 After the Rampage roll, the elephant unit must retreat 2 hexes, but two units occupy the elephant’s retreat path, a unit with one block and a full-strength unit. The elephant therefore will not retreat from its hex. 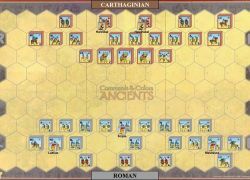 Instead each unit in its retreat path must lose two blocks—one for each retreat hex the elephant cannot complete. 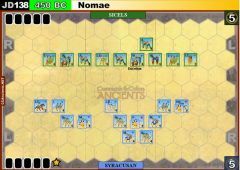 The unit with one block is eliminated and the other unit must lose two blocks, gaining a victory banner for the opponent. PLAY NOTE: Since scenarios end the instant the final Victory Banner is gained, a situation when an Elephant rampages or retreats could set up a victory dilemma, because it is possible that units from both sides are eliminated during a Rampage or an elephant retreat. The order of elephant rampage rolls is determined by the player that caused the Rampage. Resolve the Rampage die rolls, and award any Victory Banners one at a time for units eliminated by the Rampage. Using this procedure, a Rampage cannot cause a draw. 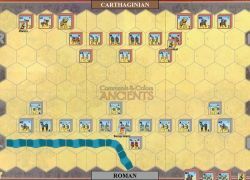 When an elephant’s retreat path is blocked by units from both sides, remove all retreat losses at the same time and award any Banners which may occur as a result of the losses. If both sides gain a final Victory Banner as a result of these loses, the battle ends in a draw. The medium cavalry unit in hex A has been attacked and has two flags rolled against it. 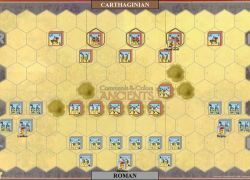 The medium cavalry unit may ignore one flag because it is supported, but must still retreat 3 hexes. 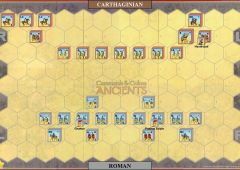 Fortunately, the first hex (X) contains a leader by himself, which attaches to the retreating unit and stops its retreat. The light cavalry in hex B is attacked and has two flags rolled against it. The light cavalry unit may ignore one flag because it is supported, but must still retreat 4 hexes. 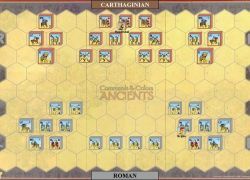 Because its retreat path is occupied by friendly units, it must lose all three blocks—one for each hex it could not retreat, since hexes X and Z are occupied by friendly units. The three-block loss eliminates the unit. Note that it could not retreat to hex Y because a retreat must always proceed in the direction of the unit’s battlefield edge.